Fun Fact: Pastrami was originally created as a way to preserve meat before modern refrigeration. Get ready for your mouth to water because Saturday, January 14th is National Hot Pastrami Sandwich Day! Locally-owned and operated Miracle Mile Deli goes through two tons of pastrami a month! So they know a thing or two about this delicious meat. 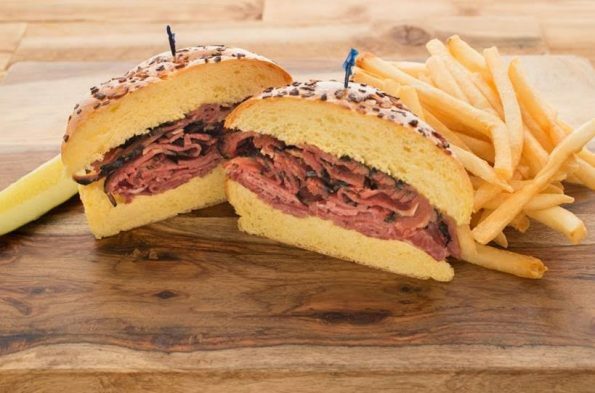 On National Hot Pastrami Sandwich Day Miracle Mile Deli is offering up their Hot Pastrami Sandwich for just $8. The meal come with fries and a pickle and makes the perfect fit for this deli-style holiday! Miracle Mile Deli has been a staple in the Valley for 67 years. The locally-owned restaurant is located at 4433 N. 16th Street in Phoenix. Miracle Mile Deli has been family owned and operated for three generations and continues to provide a unique experience in casual dining. Visit miraclemiledeli.com or like them on Facebook at facebook.com/miraclemiledeli. Mmm! I love me some delis! They remind me of the days when I was in high school and I would get a turkey, swiss and mayo sandwich after school every day!